We are just back from a trip to Albuquerque and flying in both directions we were treated to TSA Pre-Check expediting in the security lanes. This is like getting one of those great Monopoly cards that sends you to “Go” where you can collect $200! What it actually does for you is send you to a shorter TSA line which has rules like the old days before 9/11. We did not have to take off our shoes. We could leave laptops packed up in our carry-on bags. And we did not have to dig out the plastic bag of three ounce containers. It was very quick and painless! 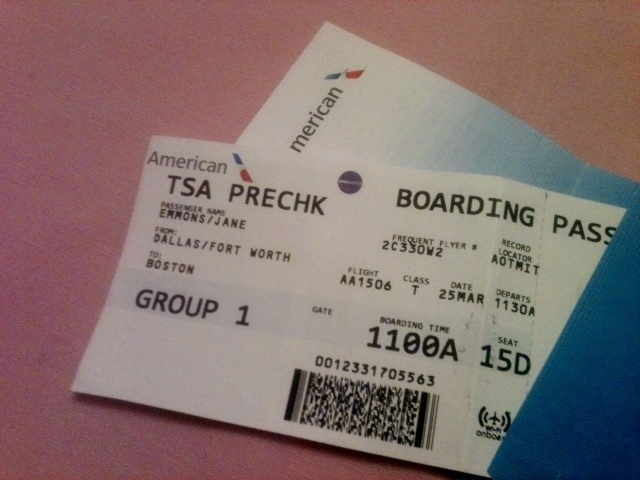 I was treated to TSA Pre-Check fast track in Boston when we flew Delta to Europe last December. At the time I thought I had just randomly drawn a lucky card and did not jinx it by asking too many questions. My husband was not given the fast pass on that trip. TSA Pre-Check status is printed on your boarding pass. Then on this trip both of us were allowed the Pre-Check treatment on American Airlines. (The status is indicated on your boarding pass.) Because this followed on discussions at the agency last week I looked into the situation further. According to the TSA website travelers can qualify for TSA Pre-Check in a variety of ways. In our cases we were honored because I have credit cards affiliated with both Delta and American Airlines’ frequent flyer programs. Thus I become eligible to be designated as a favored traveler by those airlines. According to the website the airlines gave me the chance to “opt in” to the program and I accepted. I do not remember such a transaction; I think the airlines just added this to their credit card benefits. My husband is a Gold status AAdvantage member so that provided his eligibility. We would likely be given Pre-Check status any time we fly Delta or American but not on airlines where we lack this status. Also not every airport in the US offers this. There are other ways to get TSA Pre-Check status beyond the Frequent Flyer route. You can apply to a variety of Trusted Traveler programs which will give you an identifying number. This number can be added to any airline reservation and will route you through the Pre-Check lane. Some of these programs facilitate passport control entry to the US in addition to easing security check-in in US airports. All programs require completing an application, paying a fee for a five year membership, and following up with a personal appearance or interview with the program’s administrators. Depending on how much you travel and whether you travel domestically or internationally, getting approved by one of these programs might be perfect for you. Look over the options on the TSA website to see which program suits your needs. Or you could just hope to get lucky the next time you fly the airline you are most connected to. TSA reminds us that expedited screening is not guaranteed to anyone since the agency needs to maintain flexibility and randomness in their security checks. But enrolling in one of the outlined programs will take you a long way toward moving through the security lines faster. This entry was posted in Travel, Uncategorized and tagged airport, check-in, frequent flyer, pre-check, security, travel, TSA. Bookmark the permalink.